When I coupon, I'm not doing it for the thrill of the deal, though that certain is fun. I'm doing it to be a wise steward of my family's finances. I stay home with my children and D is the primary bread winner. Twice a year, I work outside the home terrifying children at the mall taking their pictures with Santa and the Easter Bunny. It doesn't bring in much, but it serves as a profound reminder to me of how much moms who work outside the home have to juggle. I am not cut out for it. I come away from those few weeks each year with an even greater resolve to stretch every last dime we have. This week, my frugal challenge was to test the coupon policies of various stores to see exactly how much I could save and whether or not one particular store was worth my effort to even walk in the doors. 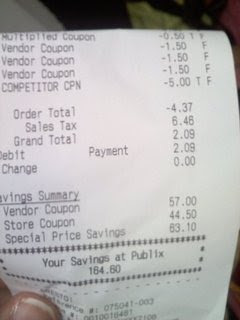 First, however, we went to Publix where I had enough coupons to get overage! 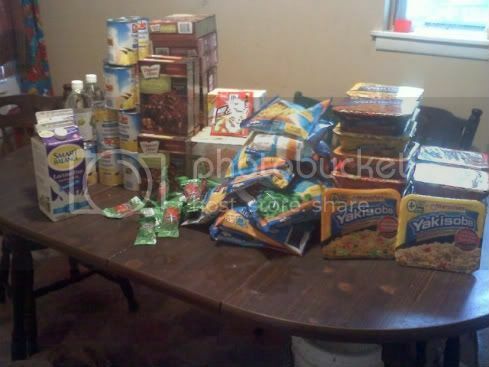 I walked away with $160 in groceries for my remaining balance on my sales tax of $2.09! I still look at the receipt and can't believe it. Then, I hit the store I hate...WalMart. I've been reading the I Heart the Mart blog, really debating whether or not their new generous overage policy made it worth shopping there. I went to WalMart fully intending to take advantage of the overage. I knew it would cause an issue, because the store I go to always has issues with coupons. 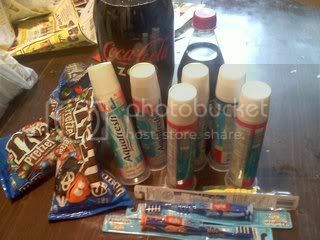 I purchased a few items, such as the dental floss and infant formula, to send to Danger Girl's class canned food drive. It was my first time EVER buying infant formula since I nursed all of my babies! The store paid me 83 cents a can. And of course, customer service had to be called and there was a minor ordeal. The cashier didn't like me, but the ladies in line declared I was the Coupon Diva. Then, I went to the store where I know I can always get great coupon deals...CVS. I love that place. I almost broke the bank yesterday, spending an entire $1.21. I used all my ECBs, but I'm totally good with that. I'll get more fairly quickly. 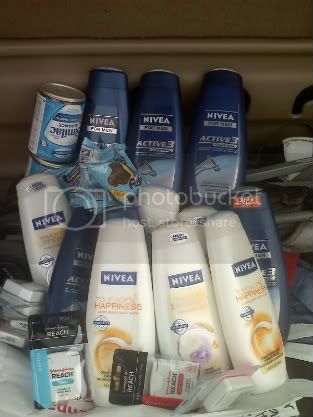 And we're totally stocked up on toothbrushes, toothpaste, bodywash, and shampoo...Not too shabby this week! Impressive! What is an ECV? ECB is CVS's rewards program. You purchase certain products and get ECBs back to use toward future purchases! I try to never every shop WalMart..I have a "banned" list that has formed over the years..they are number 2. always am amazed at your savings!